26 Apr Jennifer and Jordan Kavanaugh Residence: this riverfront property is as spectacular as its owners! Jenn and Jordan are dream clients, for a host of reasons. Aside from being the kindest and most joyful people, they were wonderful collaborators to work, mostly because they weren’t in a rush to just ‘buy stuff.’ Rather, they wanted to honour the architecture of the house. Any changes that would be made would be done with plenty of care and forethought. Moreover, they were committed to supporting local. I had been in this house once when asked by the previous owners to attend a Christmas drop-in. I remember being struck by how glorious the house, with tremendous river views. I know that the previous owners would be delighted to see the changes that Jordan and Jennifer have made. We won’t spend a lot of time on the ‘before’ photography because the ‘after’ shots are so much more exciting. – New floors were installed upstairs. Our role was to offer advice, create design boards for paint colours, furnishings, decor, lighting and, wherever possible, incorporate Jenn and Jordan’s own furnishings with the new ones. We really stood beside Jenn and Jordan rather than taking the lead. We simply listened and our conversation produced this glorious home. Changes to the entrance include new paint colours, Benjamin Moore Anchor Gray 2126-30 as an accent and Oxford White CC-30 throughout the entire main floor. New tile, door, feature lighting and a compact console say ‘welcome home!’. Live Edge Coffee Table with Acrylic Base designed by Judith Mackin & made by Brent Rourke, Gus* Modern High Park Chair, Darren Emenau Ceramics. All available through Tuck Studio. Another detail of this beautiful entrance. 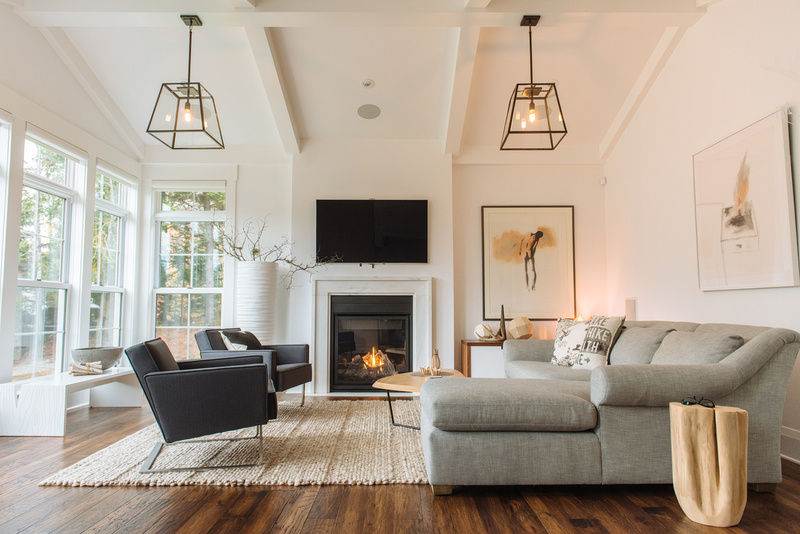 The biggest change in the living room was the redesign and build of the gas fireplace. We kept Jordan and Jenn’s leather sofas and added new pieces to complement. Featured: Gus* Modern High Park Chairs, Umbra Magino Stool, Artwork over fireplace by Suzanne Hill, hallway artwork by Ryan Livingstone, Sussex Table Lamp, EQ3 Elly Floor Lamp, Lucca 5′ x 7’6″ rug. The plants are a lovely organic touch to this serene space. The living room shares views of the river with the dining room; an open concept ‘great room’. Photos on the left are photography of Jordan’s artwork. Behind the dining table are two pieces by Ryan Livingstone above an iBride Raven “Edgar”, and artwork by Katy Karnes to the right. In the Dining Room is the Kirin Live Edge Dining Table which is no longer available. Instead, try our SLAB tables for a similar look. Also featured are Gus* Modern Graph Chairs in Vinyl Snow, Recycled Vases, a Harry Allen Bank in the Form of a Pig Gold all available through Tuck Studio. Kirin Live Edge Dining Table, Gus* Modern Graph Chairs Vinyl Snow , Harry Allen Bank in the Form of a Pig Gold , Umbra Hub Mirror 37″ Black , Hutch owned by Jennifer and Jordan. The island countertop is natural walnut finished with a raw linseed oil by Beamers Creek Woodworking. The Gus* Modern Graph Stools in Vinyl Coal pair nicely with the dining room chairs. The pop of black gives a swift kick of sophistication in this otherwise wood and serene white kitchen. Eiffel Chair White/ Natural Wood Base through Tuck Studio. Table Setting: Alison Gayton Ceramics, Kinto Slow Coffee Mugs , Dahlia Placements in Silver are all available through Tuck Studio. Bosco (left) & Enzo (right) enjoying their comfy bed! This room initially had nothing in it. It became a ‘cozy’ room for Jordan and Jennifer to watch TV and ‘chill’. We recommended that a wall be built out from the existing wall with an electric fireplace, add a black wall behind the tv and console to create warmth on an otherwise empty, plain wall. Furnishings include: Gus* Modern Hex Ottoman in Tartan Shadow, Gus* Modern Gallery Tray, EQ3 Posey Vases, Artwork by Ryan Livingstone, AS-IS Brand Barn Board available through Home Hardware. Skull, from Jordan’s collection. Spazio Table with a charcoal etched glass top and powder coated legs, artwork by Suzanne Hill, all available through Tuck Studio. The desk chair, a Herman Miller Setu Chair, is from Chandler Sales. Gus* Modern Lodge Chair in Chestnut Brown Leather and a Solemn Sky Cushion, both through Tuck Studio. Gus* Modern Annex End Table , Darren Emenau Ceramics , available through Tuck Studio. And finally – A Share to Win Contest! 1. 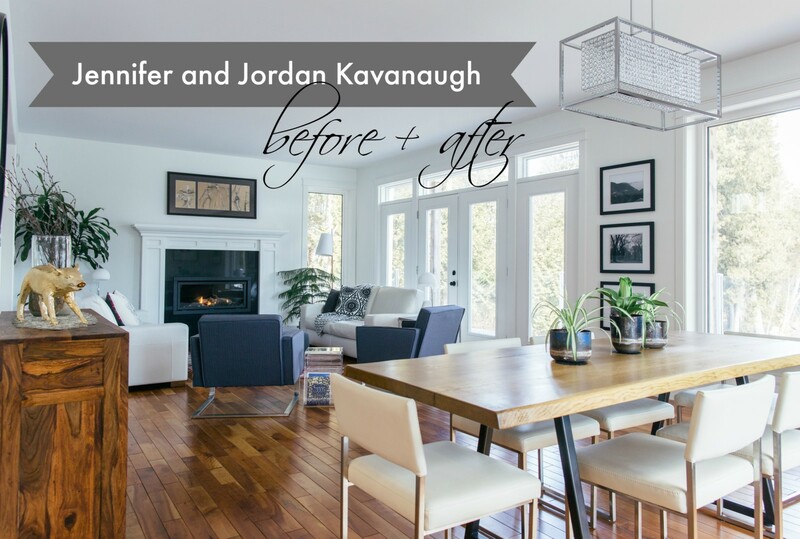 Click the link in our bio and head over to the full before and after reveal of the Kavanaugh’s dreamy Quispamsis home. 2. Once you’ve scrolled through to see the entire transformation, comment below and tell us what you loved! Did you like the beautiful view of the river? Or Bosco & Enzo- two of the cutest Boston Terriers we’ve seen? Maybe it was the array of artwork that was featured in their home? We want to know! That’s it! You will be entered to win an hour consult from Judith Mackin (@judithmackin), valued at $150! These consults are jam-packed with helpful advice and tips on how to make your space everything you want it to be. Contest ends Friday, May 11th. Giveaway not sponsored, endorsed or administered by, or associated with, Instagram.